Ever since the Global Financial Crisis led to a complete hiring freeze in the bulge-bracket investment banks, strategy consulting roles have uniformly gained more favour with the students of the select institutes which traditionally have had access to both of these “premier” roles. Although banks still find favour with those who are quantitatively inclined, consulting offers intellectually challenging work with a lot of breadth. Furthermore, consulting firms, being relatively inured to the vagaries of financial markets’ performance, tend to hire at a uniform rate each year. In addition to these external factors, MBA grads are now content with being affluent, rather than being obscenely rich albeit with a significant quantum of risk. 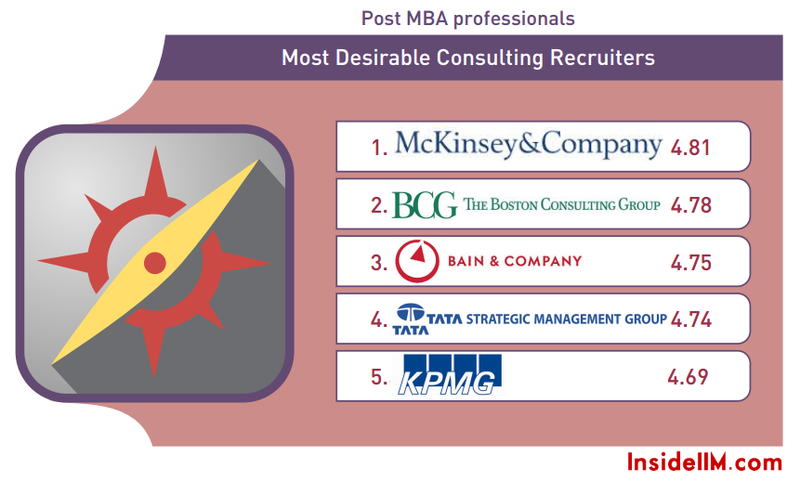 Thus, by virtue of all these factors, consulting has emerged as the most highly rated vertical in the latest edition of the InsideIIM Recruitment Survey. However, one must take cognizance of the fact that it is only the “strategy consulting” which are perceived as very lucrative and not implementation/process consulting. 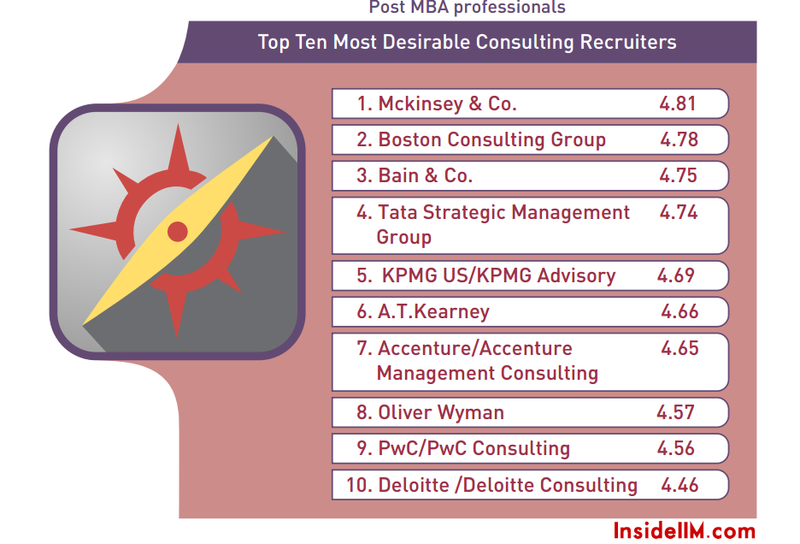 In this regard, one must also acknowledge that these strategy consulting firms in big numbers only from 3/4 campuses in India wherein only the best profiles make the cut. 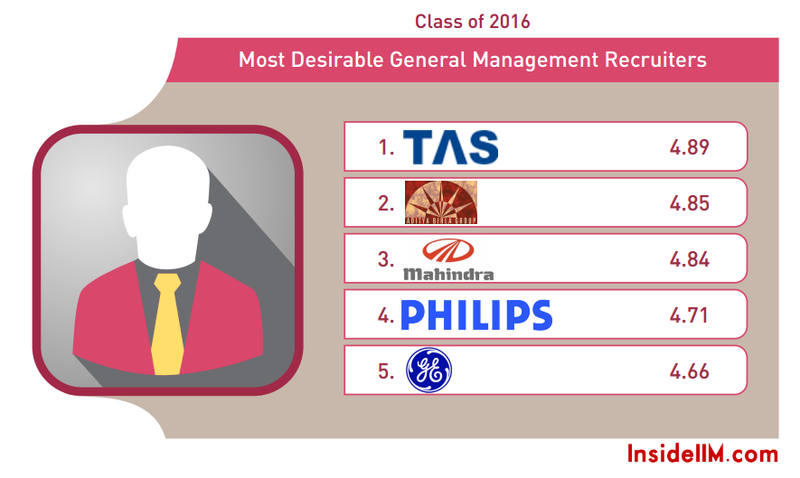 Like the previous editions of the InsideIIM Recruitment Survey, the popularity of General Management roles has continued to ascend steadily with the vertical even overtaking Sales & Marketing in two of the three respondent categories in this year’s survey. The reasons for the same are two-fold. Firstly, general management roles offer a very good work-life balance with superlative job security. Secondly, a stint in a general management firm exposes one to all the verticals of business management, thereby setting the precedent for a leadership role which the candidate may eventually envisage. 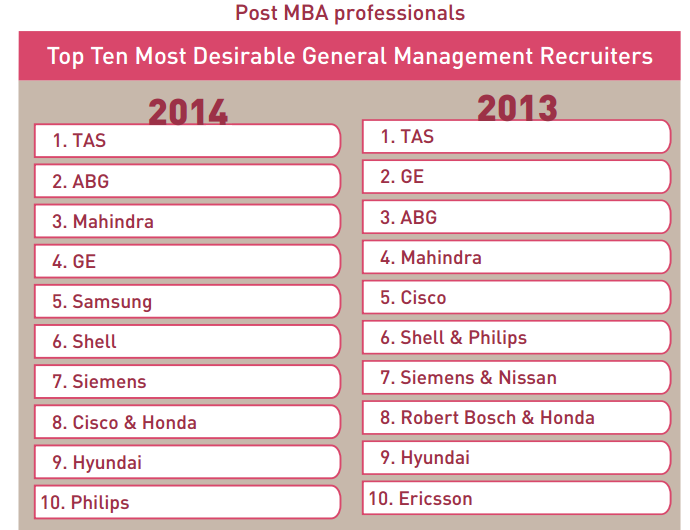 However, the big news is that none of the general management roles have managed to make an entry into the top 10 among respondents who are post-MBA professionals, despite having traditionally received high ratings from the same category. 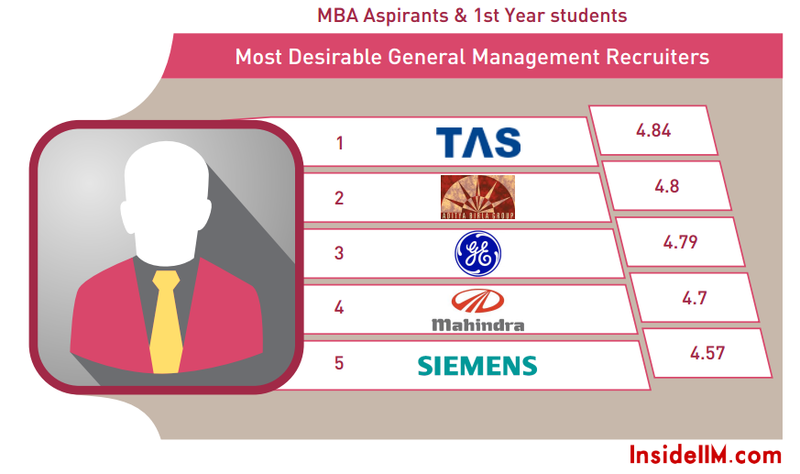 Part IV of the Recruitment Survey looks at the most desirable consulting and general management firms among business school students in India among our 3 segments of respondents. 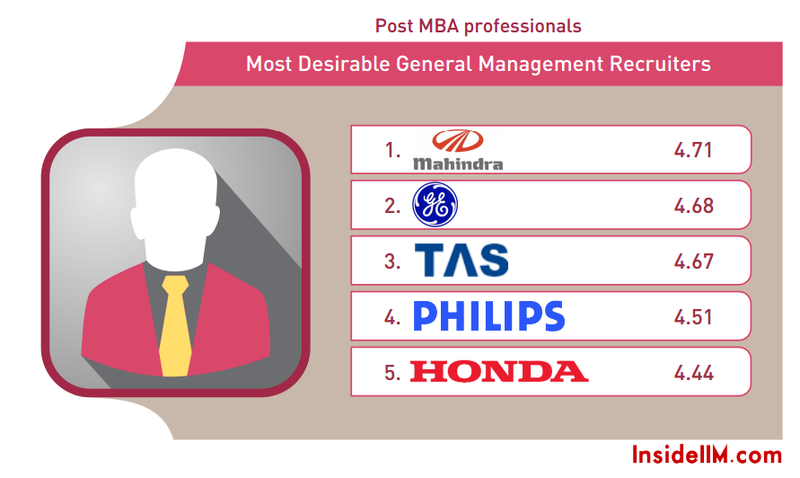 The respondents belonging to the Class of 2016 and post-MBA professionals were asked to simply classify each company into one of the 5 categories: ‘Most Desirable’ (score: 5), ‘Highly Desirable’ (score: 4), ‘I’m Confused’ (score: 3), ‘I do not wish to apply’ (score: 2) and ‘I have never heard of this company before’ (score: 1). Using this data, a weighted score for each firm was computed, which in turn was used to obtain the ranks of the firms in the two afore-mentioned categories. On the other hand, MBA aspirants and 1st year students were simply asked to select their top 5 banks. Based upon the ranks allotted in the previous step, each bank was assigned a score ranging from 5 (first preference) to 1 (fifth preference) [a score of 0 implied that the bank did not feature in the user’s top 5]. A weighted average of the same was carried out to allot a composite score to each bank. A segmented method has been utilized for the different respondent segments in order to minimize the information asymmetry entailed herein. While post-MBA professionals are bound to have a deeper understanding of their chosen domain primarily due to first-hand experience, 1st year students & MBA aspirants would base their views upon media reports and other publicly disseminated information. In fact, the latter category would in all probability not know even the intricacies of the different roles offered under the umbrella of the broad domain. The Class of 2016 would essentially possess a level of understanding intermediate to the two categories mentioned earlier. Thus, the segregation should abet in making the results more cogent. 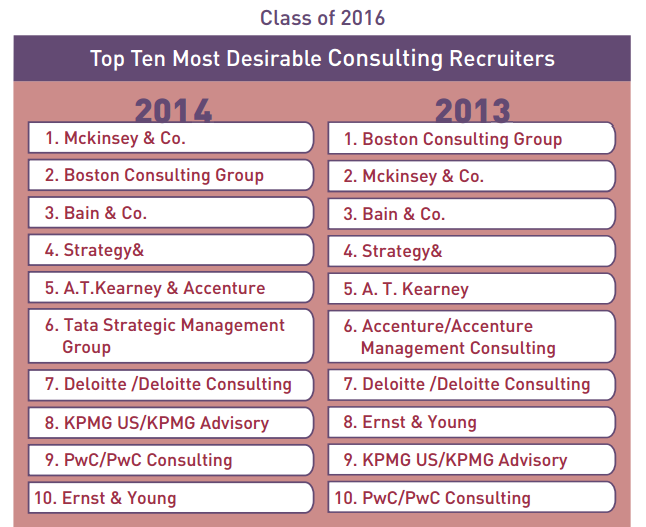 While the top 3 strategy consulting firms (BCG, Bain & McKinsey) retain their top 3 positions with reference to last year’s list, TSMG and PwC have proved to be the biggest winners. 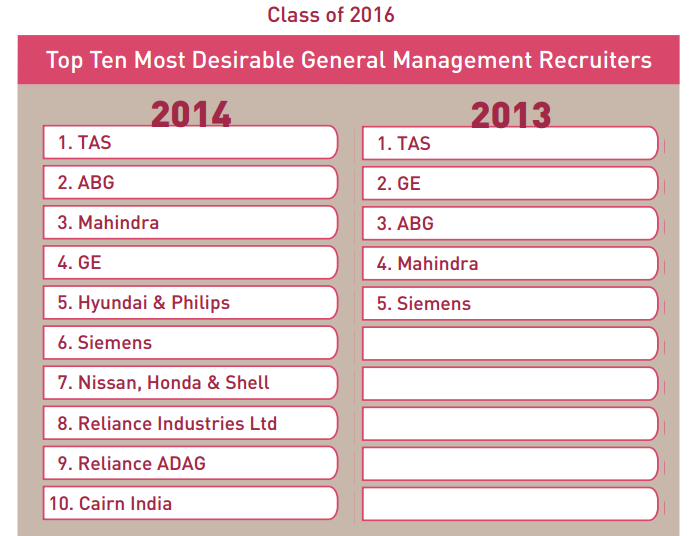 While TSMG has climbed from the 8th (last year) to the 4th position, being ranked 9th in the list is PwC’s best showing in the history of the InsideIIM Recruitment Survey. 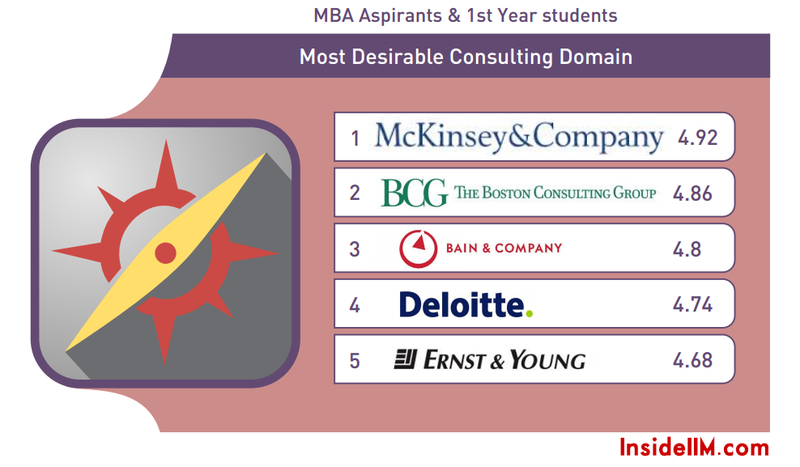 Like the previous editions, the top 3 still remains the habitué of the top 3 strategy consulting firms in the world (BCG, Bain & McKinsey) with Bain edging slightly ahead of BCG to capture the second spot while The Firm (McKinsey) continues to remain the top draw. 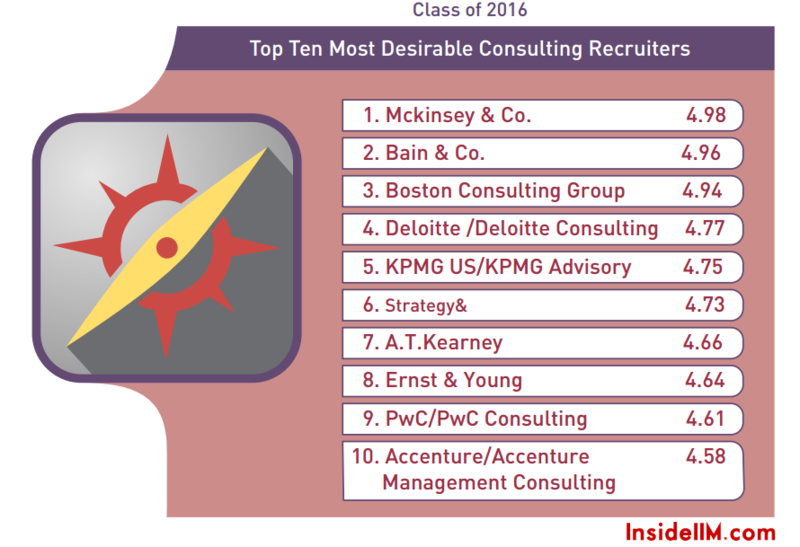 While Deloitte has proved to be the biggest winner by rising from 7th to 4th, Accenture has declined to the last spot in the list. 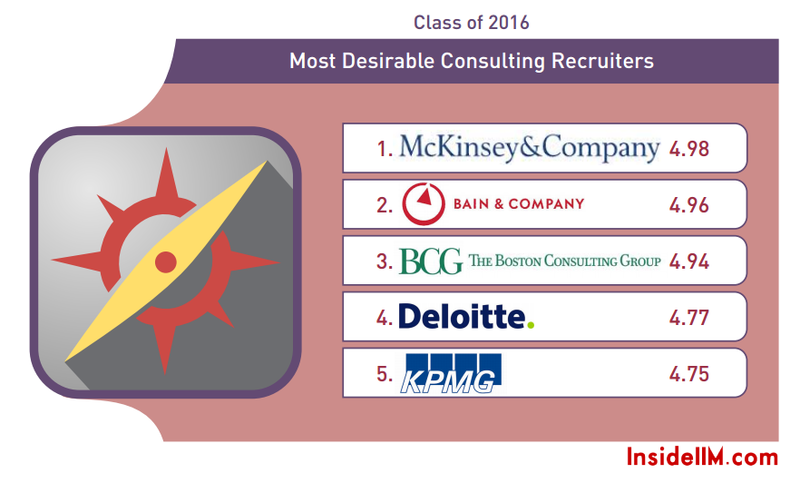 The top 3 firms (BCG, Bain & McKinsey) have shared the first three positions amongst themselves in all the previous editions of the Recruitment Survey. 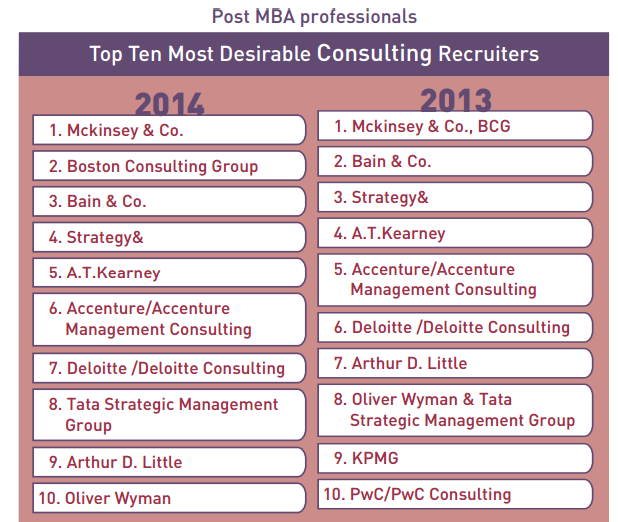 This edition too bears no exception with McKinsey slightly edging ahead of BCG to relegate the latter to the second position. The biggest winner is Deloitte who, despite not featuring in the top 10 last year, has earned the fourth spot in this year’s list. The tenth position in the list has also undergone a change with PwC dislodging Capgemini to feature in the top 10 for the first time since the inaugural edition of the survey. 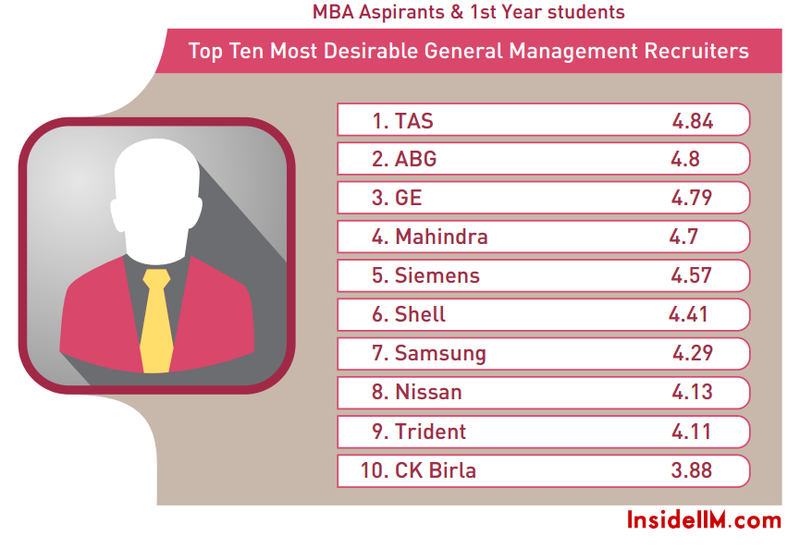 Although this year’s list also witness TAS and Mahindra acquiring top 3 positions, the biggest news of the hour is that TAS has been unseated from the top spot for the first time in the history of the InsideIIM Recruitment Survey. 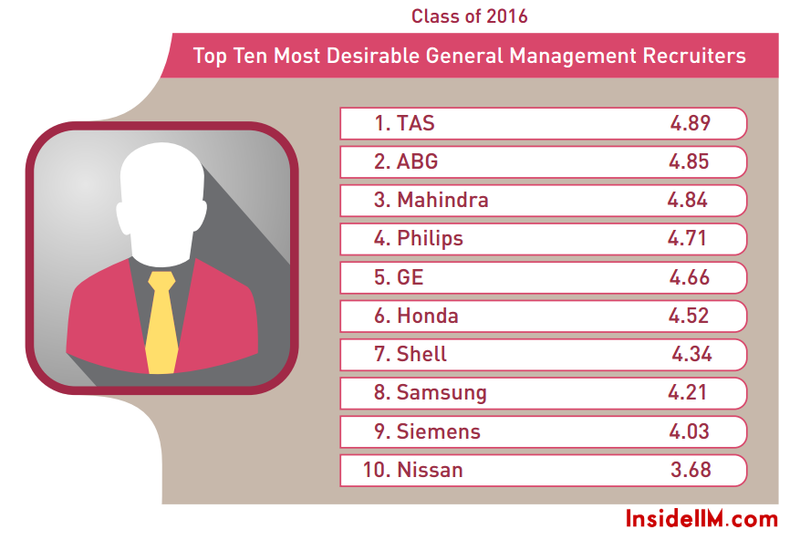 While Mahindra has indeed been impressive in its run towards the top position this year, GE has also done a commendable job indeed in being rated ahead of TAS. Apart from this, the biggest winners in this list have been Honda (fifth position), who did not feature among the top 10 last year, and Philips, who jumped from the tenth position last year to the fourth position this year. A big reason why TAS and ABG are not ranked high is simply because post-MBA professionals have little or no chance to get through to these leadership programmes. Your only chance to get through is from campus. TATA employees can get into TAS but there is an age restriction which makes it considerably difficult for most post-MBA professionals. 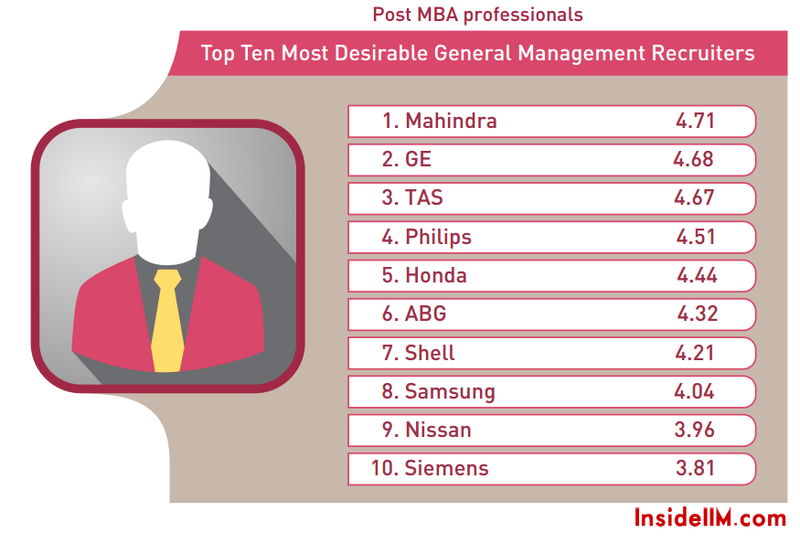 Although both TAS and ABG have managed to repeat last year’s performance by holding onto the first and second positions respectively, Mahindra has displaced GE by clinching the third spot in the list. Apart from this, Honda has indeed shown a very impressive performance by improving from not featuring in the top 10 to acquiring the sixth position in this list. Like the previous respondent category (viz. 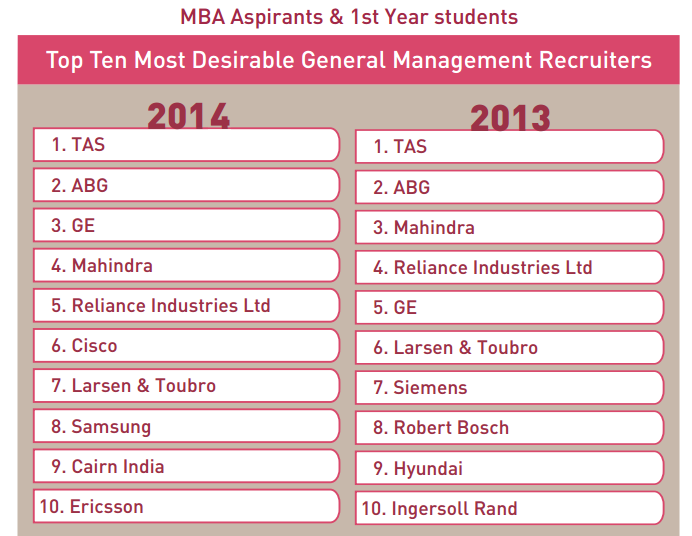 MBA aspirants & first year students), Reliance has made an exit an exit from this list as well despite being highly rated in both the lists last year. While the top 4 positions have remained unchanged with respect to last year’s list, none of the firms ranked 5 to 10 last year, sans Samsung, have managed to hold on to a top 10 position. While Siemens has ascended to a very impressive fifth position, the Trident Group has managed to break into the top 10 of this list for the very first time. Quite expectedly, the Indian triumvirate of TAS, ABG and Mahindra still manage to hold their own against the onslaught of MNCs. Although several factions do concede that the kind of consulting work done by even the likes of BCG, Bain and McKinsey in India is less “strategy” and more “implementation”, the strong brand equity enjoyed by these 3 firms has helped them remain untouched as far as the top 3 ranks go. 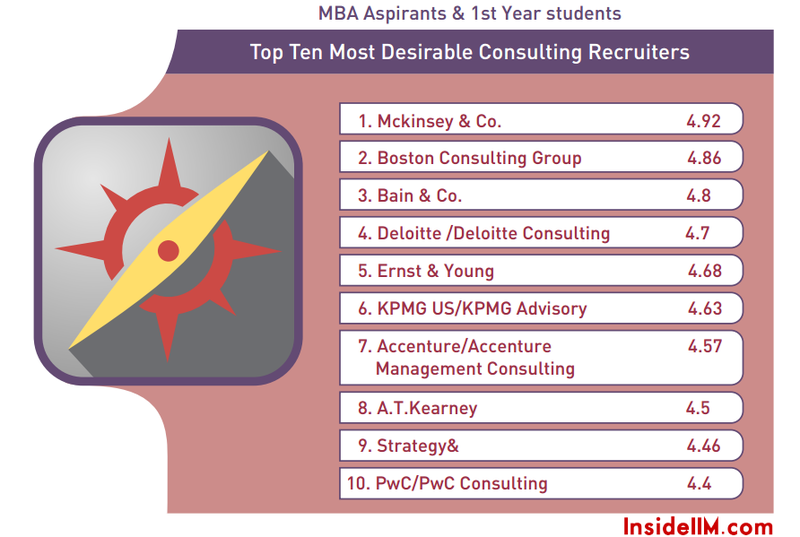 The relatively less volatile nature of consulting coupled with the perceived “elusiveness” of these jobs, has ensured that consulting emerges as the most preferred vertical for this year’s InsideIIM Recruitment Survey. As can be inferred from the rankings pertaining to the three respondent categories, the performance of the Indian triumvirate (ABG, Mahindra and TAS) has indeed been very consistent, similar to the previous editions. Thus, one can be sure that they can continue to hold their own against other verticals and attract the best candidates even in the future. 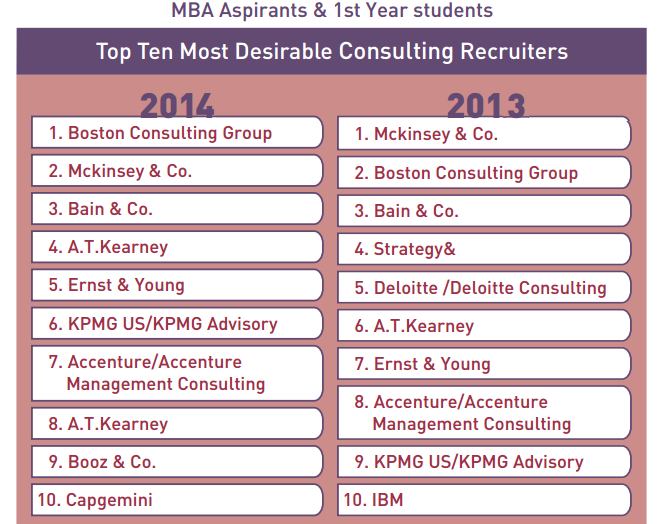 Which career is superior amongst Management Consulting, Investment Banking and General Management?